Green Laker: Things I Miss About Madison VI. 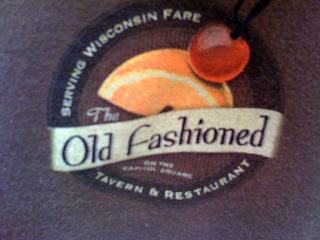 The Old Fashioned opened during our Madison tenure and quickly became our favorite restaurant. Inspired by and celebrating Wisconsin's classic supper club atmosphere and cuisine, the Old Fashioned offers great unpretentious food, great Wisconsin beers and their namesake (and Wisconsin's unofficial state cocktail) Old Fashioneds (Korbel brandy, 7up, bitters, sugar, orange slice and a maraschino cherry). Allie, Celeste and I brought many out of town guests to the Old Fashioned. Situated on the Capitol Square, it's a great way to get immersed in Wisconsin dining. The decor is full of dark wood with various vintage dairy and beer signs and lights. The 1940s Wisconsin classroom map takes up a good chunk of wall space in the front while a large antique bar occupies the back of the place. At that bar you'll find just about any Wisconsin beer you can imagine. 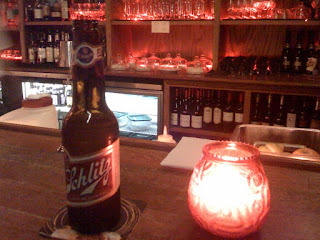 Cheap stuff like Blatz and Schlitz as well as the best Wisconsin microbrews. I'll take a Furthermore Knot Stock please. We'd always start out with an order of their excellent thin-sliced french fries and tiger blue sauce (a blue cheese/horseradish dip). I rarely strayed from the #36 - deep fried walleye sandwich with a side salad. A classic Wisconsin desert was ordered when we "had room for it" - apple pie with sharp Wisconsin cheddar. Just like my grandma used to make. This is how crummy a pic of a shirt looks when you use your phone's camera and snap it while wearing it. The last time I briefly swung through town, I introduced a couple of coworkers to the place. They dug it, I bought a shirt. Can't wait to hit it again the next time I'm back in town. Yeah but next time give me some warning and we'll meet you there!